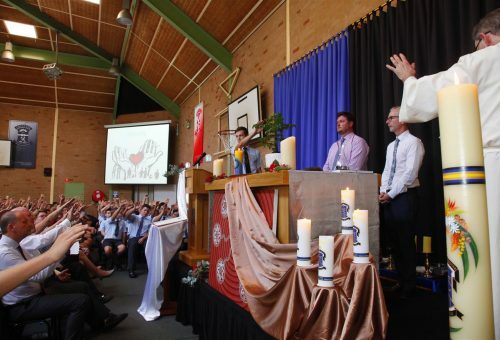 On Friday 10 February, staff and students of the College gathered to welcome the new year, share in the celebration of our faith and establish a commitment to the Theme for the Year, “Two are better than one … For if they fall, one will lift up the other” (Ecclesiastes 4:9-12). We were joined by the Executive Director of EREA, Dr Wayne Tinsey, and other members of EREA Leadership as we formally inducted our new Principal, Dr Craig Wattam, and our new Deputy Principal, Mr Damian Chase. This shared liturgy united, deepened and enlivened all who work and study at the College. It was a chance for us to commit ourselves to all that lies ahead this year, and recognise the growth and nourishment of our inclusive community.